In November 2017, this 16-year-old gent came to our clinic. 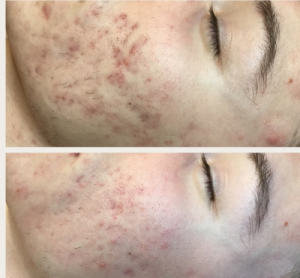 He had over the previous 2 years had 2 courses of Roaccutane (3 month course & 12 month course) and then on antibiotics for 7 months. His skin was congested, cystic and had become thinned and very sensitised. We prescribed topical plus internal skincare and a probiotic to replenish the gut post antibiotic. We also recommended a peel kit for him to use at home. These pictures were taken 6 months apart with 3 in-Clinic treatments carried out once every 2 months.